Pew Research has just released a study called “Social Networking Sites and our Lives,” by Hampton, Goulet, Rainie and Purcell. 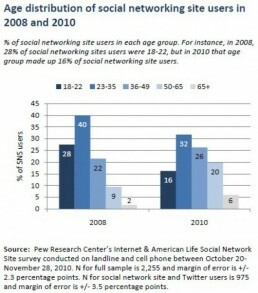 It appears that Facebook, Twitter, LinkedIn and the like are no longer the bastions of the youth of the world. From 2008 to 2010, social networking site users over 65 have grown from 2 to 6 percent and those aged 50-65 have grown over the same period from 9 to 20 percent of the total user audience. This growth in the middle-aged and older segments has huge implications for brands and their marketing efforts. A good Facebook strategy can now target a significant number of customers older than 50. I would bet that next year, we’ll see similar if not ever greater growth. Social networking is enhancing our relationships with people we haven’t seen for a long time and it is viral. When one friend starts, he or she hits all of their core friends and it keeps going. It revives dormant relationships, the report says. This is great news for marketers. At Fusion, we have been getting increasingly great responses with the use of integrated and Fusion-managed social media strategies for many of our clients.